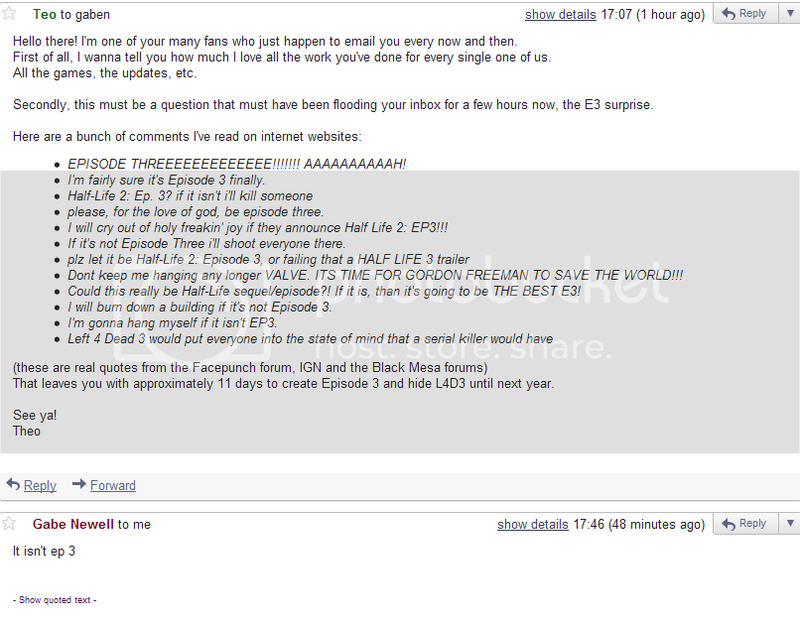 The folks at fan-site HalfLife2.net followed up with Newell, asking about a mysterious image that sprang up in recent days. The image, set against a black backdrop, shows the lowercase Greek letter lambda--appropriated by Valve as their logo for the Half-Life games--with the words "Freeman" and "June 14th" below. Newell's response? Valve's been teasing fans and press alike in recent days. We received an email last week announcement the cancellation of a June 14 "Portal 2" event. Portal 2--announced in March--would be the (presumable) sequel to Portal, Valve's topsy-turvy first-person Euclidean geometry-bender. In the email, that event was "replaced by a surprise." "And even though the cancellation of the event certainly counts as a surprise," teased Valve, "we are pleased to further announce that the cancellation of the event is not THE surprise." Other things that (probably) aren't the surprise: Half-Life 3, Left 4 Dead 3, Steam 2: Steamier, or Valve changing its name to Stopcock.